Upon having released their second studio album, Illuminate, in 2003, the David Crowder Band left an indelible mark on contemporary/modern/post-modern worship with their huge successes "O Praise Him (All this for a King)" and "No One Like You." 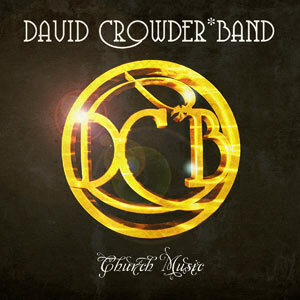 Their release in 2005 of A Collision showed us what Mr. Crowder was capable of and brought a legitimacy to the post-modern worship genre that so needed a facelift. With Delirious' impending retirement later this year, the David Crowder Band will have to pick up the torch as the new face of modern worship and Church Music does just that. Church Music picks up where Sunsets and Sushi would have taken us had it been a full-length LP of new work. Leaving the bluegrass, southern flair on A Collision and the return to pop-rock on Remedy, from beginning to end Church Music astonishes, mesmerizes and reaffirms that original, out of the box, unstereotypical worship is what David does best and what the genre needs, and deserves. From its opening "Phos Hilaron (Hail Gladdening Light)" to its other bookend, "In the End [O Resplendent Light! ]," nearly every track captures the attention and directs us to a full-on worship experience that is not only pleasant to the soul, but also pleasant to the ears. While Church Music is primarily electronically influenced, with the infusion of rock, several heavy guitar solos and slight orchestral arrangements, it avoids the feel that these are B-Sides from a previous record in their make up. A full fifty seconds longer, yet four tracks shorter than A Collision, several songs surpass the six minute mark, but most are a healthy four to five minute length so as not to get too overlong or drawn out. "Phos Hilaron" opens and readies the listener's heart by worshipping God with singing His praise in the lyric, "We hymn the Father, Son, Spirit divine. Worthiest art thou at all times to be sung...," setting a tone for the album not only musically but lyrically as well. "Alleluia, Sing" follows with the truth of the Gospel that God will come to us regardless of times of seasons or possible devastation. Out of all the tracks, "Alleluia, Sing" feels most out of place from a musical standpoint, but is a strong track nonetheless. "The Nearness," which follows, really picks up the electronic tone of the rest of the record, with its near techno-like melody and sings of God's return beginning with our salvation. As the song closes, it leads into "Shadows," the first single on the record, and the transition is flawless. As the album plays itself out, the tracks are full of flawless, seamless transitions that a live show or even a church setting might have. "Eastern Hymn" follows with a heavier electronic beat layered with an old school 8-bit Nintendo game soundtrack feel, but also layered with some gentle strings in the bridge to break it up a little. "SMS (Shine)" follows and opens with soft piano and a light electronic beat. Lyrically, like the rest of the record, it is very poetic. The chorus sings, "Shine your light so I can see you, Pull me up I need to be near you. Hold me I need to feel love. Can you overcome this heart that's overcome?" feels like a dance that can only be had with a Savior. As "SMS" closes out, "The Veil" picks up on the same beat and intros with a heavy techno club beat. One might think that worship music with an electronic, techno beat might not be appropriate, but the lyrics, "Hallelujah, we rejoice What a Savior, what a King. Hallelujah, lift your voice to our Savior, to our King." fit with the rest of the record and the soft and gentle female voice add more depth to the track. As it dies out and the beat remains, "We Are Loved" begins and leads into "All Around Me." Thinking about a worship leader covering a hard rock band's standout track might sound almost like a conflict of interest in some people's minds. But the simple piano and David's amazing vocal rendition (best vocal performance on the album) make the listener realize that Flyleaf wrote a great worship song regardless of the style of the song. The tender violin in the bridge section, and the thunder effects in the background that continue until the conclusion of the song and the first verse of "How He Loves" make it a great transition to the second half of the record. The two tender songs side by side don't fracture the record at all, but help the listener realize that Christ's love can be conveyed in a hymn, a pop song, techno or a beautiful ballad, while setting up the second half of the album. "Can I Lie Here," another tremendous track, has a simple premise in resting in God's arms. The 80s like melody envokes visions of someone running into a lover's arms. "Birmingham (We Are Safe)" and the title track "Church Music-Dance[!]" follow. "Church Music" is another standout track with a funky disco beat that would sound amazing live and would make TobyMac proud. "What a Miracle" follows as well as "Oh, Happiness," a joyful song that can't help but make you smile, break out in goosebumps, and rest in the comfort of God's grace. The chorus, "Oh happiness, there's grace. Enough for us and the whole human race..." sounds like a singalong that would be amazing live. "God Almighty, None Compares," with its two minute guitar solo in the final two thirds of the track, helps close out the record along with "In the End," in which the listener is reminded that at the end of life, all the things that plagued us on this Earth will be erased. So while we're on this Earth, take the time to worship God with no inhibitions or pretenses, which the David Crowder Band certainly did on Church Music. I recall vividly a friend's birthday party at a picnic grounds back in 1995. DC Talk's Jesus Freak had just released as a single that Summer (not yet the full album), and since this party had a professional DJ, I tried throughout the duration of the entire party to get the DJ to play the song, but he wouldn't do it. At last, after most of the attendants had gone home, I asked him again and he finally, but reluctantly, played the song. As the opening acoustic guitar broke into the electric guitar riff, the DJ exclaimed over the music in a mixture of shock and joy, "This ain't church music!!" David Crowder and his team of skilled musicians turned heads far and wide - even in the mainstream - with their 2005 genre-bending project A Collision. While their follow-up, Remedy, didn't quite have the same impact, their newest project, Church Music, is likely to cause quite a stir. In listening to the opening track, "Phos Hilaron [Hail Gladdening Light]," followed by the songs that succeeded bearing a similar tone and artistry, I was reminded of that DJ with the preconceived notion as to what "Church Music" meant to him.